In a desperate attempt to keep the momentum up on the whole buildings and IT comparison thing I have laid out in the last two posts I want to investigate a little more. Very much work in progress but then what isnt these days 🙂 We call it WIP. In another world it has a different connotation of course. Funny old industry isnt it. 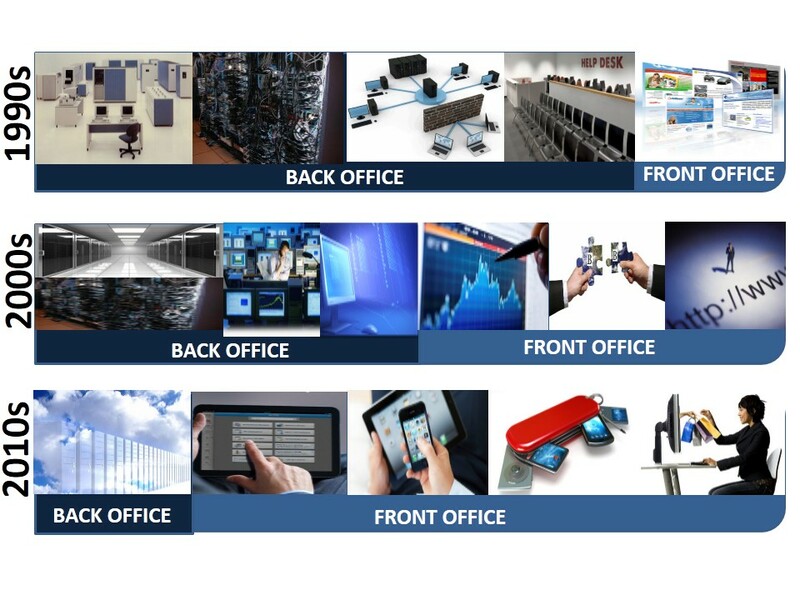 A while back I posted about the concept of Back Office and Front Office. Some call it BOFO. For an IT organization this BOFOis a big deal. It is where they decide to invest their cash. The keep the lights on in the BO, and try and innovate and contribute to business growth in the FO. BOFO. It is where an IT organization struggles daily with the pressures coming from the consumers ( internal and external ) in the FO and the impact on the speed of change ( or lack of ) in the BO. For anyone advising an IT organization therefore this BOFO becomes an even bigger big deal as consumerisation kicks in at work. You see a lot of people ( customers and consultants ) still take technology ( it doesnt really matter what flavour and brand ) and attempt to apply the features and benefits to an IT organization regardless of the make up of the BOFO characteristics. So people selling virtualization technology to a customer who has a big FO and a little BO may come unstuck because they have already done some virtualisation. Or someone selling app dev to a customer who has legacy BO infrastructures that do not sit easily with modern development technologies may also come unstuck. In the building analogy its a bit like trying to sell double glazing to someone who has it already or is living in a listed building and who cannot change the exterior facade no matter how compelling the options may be. Look at these diagrams below. what do they represent. As technology matures and becomes consumerised the speed of change has shifted the focus from Back Office to Front Office. The 1990s were full of traditional heavy lifting back office processes and technology. Most of IT existed in data centers surrounded by traditional tools and processses. Helpdesk services were all run in house and the Front Office was limited to web sites for marketing and basic consumer and customer interaction. Very 9 to 5. IT was 90% of the transaction with its end user customers. During the 2000s virtualisation and Managed Services began to transform the Back Office as people realised they could improve service and reduce cost by reducing the size of the Back Office both pyhsically and in terms of cost. In return the way applications could be delivered to Front Office staff and customers meant a more 24×7 service that relied less on the Back Office.Now today ( 2010s) sees a very lean Back Office built predominantly on cloud services ( public and private ) that pushes most of the IT into the hands of the employee and consumer and where the most of the transaction occurs without any direct IT involvement i.e. self service helpdesk, B2C transactions, 24 x 7 service. Now imagine a building that has also gone through these last 3 decades. In the 1990s it would have been very traditional. Open plan office with a mix of side rooms. Very dated furnishing and decor. The same as everyone elses. The experience of using the building was predictable and the costs of running the business were all going on keeping the building open – power, cooling, maintenance, staffing. The same building in the 2000s would have gone through an internal change as its consumers demanded more flexibility on the internal structures and services offered. Still the Back Office of the building management was remaining traditional but the way the services were delivered became more agile as the consumers demanded more and choice was growing for alternative working patterns. The modern building is now ( 2010s) much more open. The exterior may have gone through a total revamp. Interior change has become total. The building now grows with its consumer. Agile working practices demand that the building is capable of being remodelled to suit new consumers on a much more accelerated nature but still taking advantage of sustainable resources and offering a better cost model to both running the business but also consuming the building. Why is this distinction important. Well it highlights to me ( anyway ) that an IT organiszation is more like a building than we perhaps think.Just like the modern architects who are seeking to innovate with their use of construction materials, reusable components and environmental features, a modern IT environment has to cope with the differing speeds of their BOFO. Cutting to the chase within the building and modern IT infrastructure things happen at different speeds. A lift versus the HVAC system have different characteristics lifetime, maintenance schedules etc. cleaning the outside windows maybe an annual recent whilst cleaning the desks and carpets may happen nightly. Ditto application upgrades may be a intermittent event driven by software lifecycle policies whilst a request for a new user maybe driven by a well defined SLA on the service desk. Monitoring the car park CCTV may be a constant process for security personnel whilst monitoring firewall logs may be a reactive activity only called upon when there is a perceived breach. Wear and tear of desk furniture may be written off across a 10 year period whilst a consumer may be able to access their IT services from anywhere in the building as they embrace a BYOD policy. Assets in the building may still undergo a regular physical quality control check to conform to a H&S committment whilst other assets may use a Machine2Machine process ( SIM in a smart meter basically ) to alert a central console of a capacity issue or fault situation. The list is endless. Events inside a building happen at different speeds. Events inside a IT organisation happen at different speeds. This speed is the big deal. IT Organizations steeped in the ‘fat Back Office’ often struggle to adapt to the speed of change. Perhaps they dont realise they need to unless it is too late. Whereas the IT organizations who have move to a leaner Back Office and faster Front Office are now fully engaged with how technology can help its consumers become more self sufficient and productive. I find this a fascinating subject and if you can get your ‘story’ straight you can really come across as someone who can take ‘technology and all who sail in her’ to a customer and help them make sense of how they can turn their IT organization into one that understands the speed of change. Buildings and I.T – similar? I hoped you liked the building post as this is a continuation of that theme. Have you ever imagined why buildings seem to cope with change? No? Well outside of the obvious things like they are built from sturdy long lasting materials, were designed to deal with extreme weather , will flex with internal changes made to them and survive what the occupants do to them when they work and live in them, buildings have a knack of coping with the PACE of change. Whilst we all understand change in our technology world (some of us are paid to manage IT change and the rest just demand it and OK a few resist it) I often wonder if we truly understand the PACE of change. For quite a simple word PACE is fast (excuse the pun) becoming the big word in what we talk about today. Unless you are a runner or cyclist PACE is probably a word you never use. Certainly in many IT departments (and businesses) the PACE of IT is not a conscious thought. Of course people understand that change comes for both opportunity and risk. We all get that when we introduce technological change there is a view that the recipients of the change will develop their skills and capabilities at different times. Many people today view the whole cloud story as the ultimate solution to pace. Mobile technology is a blitzing along at a fair old PACE, as is social networking. But other areas move a lot slower and this is why understanding PACE is so important. Unlike a building the development of an IT infrastructure typically did not start with a formal design that had the concept of pace built into it. Look at the Olympic stadium. The architects and designers created a structure that totally understood pace. The construction was fit for purpose for the 2012 Games but will now move into a new phase where it will cope with both exterior change ( the top tiers can be removed I’m told ) and internal change as it supports a whole range of sporting events. But like all buildings the plot of land remains the same as does the actual structure itself. It will be the internal components or assets that will undergo a different pace of change whilst still providing a service to its ever changing customers (athletes, spectators, entertainers, residents). Basically whilst the pace of change in some areas speeds up to meet the needs of the current occupants, the remaining areas were designed to cope. The modern building architect now looks well into the future to make sure their structures can cope with the speed of change. Modern city planners are equally interested in the traffic and people flows as they are in building regulations and health and safety. Now when you look at a corporate IT infrastructure you will never see an original design. You will never see the architects diagrams or blueprints. You will never meet the person who ‘designed’ the IT. Why? Well IT unlike a building does not have the concept of the pace of change built into its core. This is not surprising as IT has moved so quickly there isn’t a network out there today that can be traced back to an original design 30 years ago. Maybe in the next 30 years it will be possible because the future network will be cloud hosted and the consumer will not be bothered about managing legacy and modern together. Oversimplifying again let me drill a bit deeper. Consider the cabling of an IT organization. When it was put in there was probably a vision that the planning would accommodate change within the organization occupying the building at that time. Flood wiring a floor was common practice so as the business moved people around there was always somewhere to plug your PC into. But when one occupant left and a new one came in it was common for the cabling to be stripped up and a new design installed to cope with the new occupants desires. Of course wireless is now making this less an issue but still the fabric that our data travels along too often is not fit for purpose as the occupants demand new features. Now look at the other technology bits and pieces. Storage, Servers, Security, Management. I’m deliberately leaving applications to my next post. What else? Service Desk? Business Continuity? Licensing? The list goes on. In the building world these represent windows, doors, furniture, HVAC, lifts and so on. Businesses make decisions to deploy ‘upgrades’ to these assets – like a desktop upgrade or a storage refresh project – without any true concept of the pace of change. Sure they consider the impact of these projects but do they really? If they had to build their IT infrastructure like a building architect had to build a new office facility would they survive. Do they understand how individual components of an IT infrastructure needs to understand the pace of each other component? How does a modern day PC with all the latest internal components and software versions really cope with the much older and less agile cabling infrastructure, support desk tool or management consoles? How about the decision to allow a BYOD policy? Does this ensure that the back office applications are engineered to support the new interfaces or security requirements? What about the decisions to increase the storage capacity for the new CRM application? Has anyone understood how the internal workflows with other applications that are built on ageing code will actually work together? New security threats come and go yet the knowledge and skills of internal security teams? Do they keep pace? How much does keeping pace truly cost? Previously I have posted before about the DNA of an IT service desk where the events in any given week (planned/unplanned) can give a real insight into how a desk is coping (or not) with the pace of change. Just see how long a desk takes to deploy a tablet device to the CEO is often a clue. A great place to look for the pace of change. I have also posted about the concept of a Legacy Load Index which sees core business services being identified against their legacy to a business i.e. the age of hardware it runs on, the skills of people with subject matter expert knowledge, the contracts and support still available and so on. Another place that highlights an organization’s ability to deal with the pace of change whilst managing legacy. And I have posted about things like maturity and capability of our IT processes and people to deal with this technology change. Words like Good Better Best feature high in my vocabulary as we look to match all these aspects together into a functioning IT service (the analogy of a working office building applies). And we also know this is a massive challenge. Whether it is a project overrunning, or being able to troubleshoot and resolve a specific IT fault, our industry does not fare well when compared to the building industry which has nailed the ability to manage complex projects to satisfactory outcomes. I often wonder what it would like to do a job swop for a day! So in close I suggest that as we look at an IT infrastructure we can start to see what a building planner or manager sees. They look at how all the components in a new building or in a refurbishment project will actually work together. They have to. Its contractual. Significant sums of money are at stake if they get it wrong. They look at how the water system will interoperate with the power design for example and drive sustainable energy options like solar panels. How altering the window design will affect natural light and therefore may impact HVAC systems. How sound proofing may affect room layout or how the landscaping of the plot will fit in with the surrounding buildings and therefore attract the best price. The list is endless but they all have one thing in common. They all are considered against the PACE of change and are designed to work with each other. They build in contingency. They factor is wear and tear. They consider changes in volumes and loading. They do all these things to ensure their design copes with the pace of change. Buildings. We live in them. We live round them. We demolish them. We rebuild them. We refurbish them. And we can learn from them. These images represent views created using Building Information Modelling techniques that allows architects and planners to turn a building ( and entire cities ) into a 4 dimensional structure that treats all the elements of the building as an asset that can be used to model infrastructures to fit into surrounding landscapes and environments. Why? Well because city planners and environmentalists need to build our 21st century buildings to become easier to power, cool and maintain to reduce the emissions and costs of supporting our planet. Not an insignifcant challenge. The key word therefore is asset. More on this later. Now consider the same approach to technology. We already understand the asset word. For decades we have built IT assets, replaced them, upgraded them, secured them, lost them and supported them. They include digital assets, phyiscal assets and people assets. yet the widening gap between how a building matures and serves its residents and how an IT infrastructure matures and services its residents ( users ) is enormous and is getting wider and wider. To understand this we need to look at the characteristic of a building. Look round your house. It is very likely you will never have to replace a brick or replace the roof. Nor will you have to replace the windows more than once at least. However it is likely you will have to redecorate the living room a couple of times or replace the curtains and furnishings much more frequently. Decisions you make will be influenced by fashion, your budget, what your friends have done and so on. Where you work. The building may have been built 50 years ago but there is a good chance the internal fabric has undergone a refurbishment of lift lobbies, toilets, ceilings etc. The external fabric may also have been touched up yet the original building fabric is the same as the architect designed it. Look at the popular practice in many cities around the world, where space is limited or building new projects is prohibitive, of taking an old building structure and completely gutting the insides whilst maintaining the exterior outer fabric to maintain the architectural balance with the other properties or to maintain a historical advantage. Many run down areas of UK cities have been turned into luxury accommodation in this fashion. And the one thing that all these buildings have in common is that the designers of the original structure realised that the design would need to accommodate the needs of various owners and purposes. Through a series of layers the architect created a distinction between things that would never change like the plot of land, to components ( assets ) like furniture, windows, lighting that may change or be moved on a frequent basis. And in between there would be the fabric inside and outside like the walls, floors, ceilings that could last for a long time but also could undergo change. And finally there would other assets such as lifts, air conditioning, central heating, wiring that would be replaced quite often to meet the ever changing demands of the occupants. Now consider your own house and you may see similarities unless you live in a caravan! The important thing is this. The pace of change. You see architects for centuries have understood this. From the pyramids, Romans Victorians and now the Olympic Park 2012 planners, these guys absolutely have nailed the pace of change in what they designed and built. This is probably why most of their structures are still standing and allowing 21st century occupants to enjoy their facilities. And now we have buildings being turned into assets that can be designed, built and then managed the architects are now proving their skills at managing the pace of change has stepped on even further. You see the pace of change is simply a clear and unequivocal understanding that things happen at different speeds. Whether it is the decaying of an outer wall, or the decaying of paint or pipe work, these architects are experts at working their designs to compliment and correspond with the different speeds of ageing and modernisation. Come on – we all marvel at how old buildings are transformed into modern wonders of architectural brilliance whilst maintaining the aesthetics of the original designer long gone. So why cant technology we use in our corporate world have the same appreciation of pace of change? After all the equivalent to the building has similar characteristics surely? Well this is where the problems begin to start. The technology world is only a good 60 years old and for most of us it only features in the last 20 years or so. We are novices therefore compared to the architects of yesterday and today. Boys versus men. Our skills are not as fined tuned as the architects and designers. We have similar titles of course like Enterprise Architects, Project Managers and System Designers but the similarities usually stop there. We have certifications and frameworks like ITIL, COBIT, Prince, TOGAF but again these are poor relations to our construction colleagues. We also manage assets like PCs, software, storage, data, networks but again the comparision to the thousands of assets in a modern office block or millions of assets in a large city is vast. When a technological change comes along too often the planning and deployment fails to meet the expectation and leaves a bitter taste of incompatability and cries of not fit for purpose. Can you imagine the same outcome for a office refurbishment or regeneration project. On balance it is a well known fact that IT projects too often fail to deliver. Building projects on the other hand more than not meets the desired outcomes. Now the smart IT department is one that understands that the IT ‘building’ has different layers like the building architects. They understand there is a pace of change between different assets they manage and for these guys they tend to be so much more successful than their counterparts who treat technology as silos and one dimensional events. And guess what. The businesses who recruit, train and retain these IT architects and planners tend to be the more successful in what they sell, build and support. Why? Because their business thrives on the IT service provided because their IT people are managing the pace of change proactively and with the same ‘governance and discipline’ as the guys who designed and managed the building they are sitting in doing their stuff. I sense there is more to come on this topic as I have more things buzzing around.